Irrigation water infrastructure in the Awash river basin. EfD researchers asked farmers directly about their willingness to pay and their preferences regarding irrigation services. Then they estimated the value of irrigation water in order to develop efficient prices. Agricultural production is very important in Ethiopia, where more than 80 per cent of the population is involved in farming. Today, farmers can use irrigation canals for free to water their agricultural land. But not all Ethiopian farmers have access to irrigation services, and water availability is limited. At the same time, there is a need to increase agricultural production and productivity to secure a sufficient food supply. With climate change, it is expected that the food supply problem can worsen as increased temperature and variation in rainfall negatively impact agricultural yield. ‘Irrigation is an important potential solution to this problem. If more agricultural land could be irrigated, production and productivity would increase. We believe that the introduction of a price on irrigation water will help efficiency in water use. This in turn means that the same amount of water can irrigate larger land areas. Then, agricultural output will increase’, says Dr Alemu Mekonnen, Senior Research Fellow and past Center Director of EfD in Ethiopia. Mekonnen is also Associate Professor at the Department of Economics, Addis Ababa University. The Ministry of Water, Irrigation and Energy asked EfD Ethiopia to conduct a study to come up with an estimate of the value or price of irrigation water. The Ministry also asked the EfD researchers to study the management of irrigation schemes in different regions of the country. ‘We found that a large majority of farmers are willing to pay a considerable amount of money for irrigation water. This means that the government has support for this kind of proposal. There are other studies that show that quite a number of Ethiopian farmers are aware of climate change. They have noticed changes in rainfall patterns and increasing temperature. It seems they really see the importance of water’, says Mekonnen. The estimated price of irrigation water to farmers reflects the cost of maintaining the irrigation canals. It does not cover all investment costs the government has had for establishing irrigation systems. One possible approach to scientifically determine the price is to use the estimated cost of irrigation water supply and distribute this cost across all households. But environmental economics methods also reflect the farmers’ preferences related to irrigation water, as well as their willingness to pay for different options. ‘As environmental economists, we go out to the field with questionnaires and ask farmers directly how much they are willing to pay to irrigate a particular area of land. We also identify important characteristics related to irrigation and estimate how much farmers are willing to pay for the different characteristics, as well as analyze factors affecting farmers’ willingness to pay’, says Mekonnen. For example, the environmental economists wanted to see how interested farmers are in the number of crop seasons. With rain fed agriculture, there is only one rainy season in the area and farmers can have only one yield per year. But with irrigation, they can produce two or even three times a year. The importance that farmers attach to frequency of watering in a crop season was also studied by the EfD researchers. They wanted to know if farmers are willing to pay more if they are able to water their land more frequently in one single season. ‘Our hope is that our estimates can be used by the Ministry as inputs for further work by them. For example, the Ministry may introduce a price for irrigation water, in which case it can use the results from our study to set the price’, says Mekonnen. The results of the study were presented at a workshop organized jointly by EfD Ethiopia and the Ministry of Water, Irrigation and Energy. It was opened by the State Minister, H.E. Engineer Wondemu Teklie. In addition, the minister attended the workshop and awarded EfD Ethiopia a certificate in recognition of its contribution to the research on ‘economic valuation of irrigation water’ and ‘institutional sustainability of the irrigation sector in Ethiopia’. The research was acknowledged as a pioneer contribution toward the sector’s efforts to become research-based. Dr Alemu Mekonnen speaks about the value of irrigation water in Ethiopia, where more than 80 per cent of the population is involved in farming, and irrigation water is free. 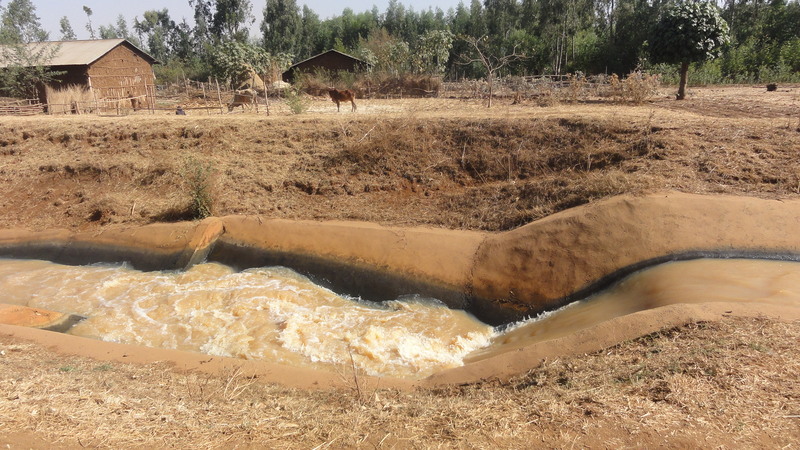 EfD Ethiopia’s research findings show that pricing irrigation water will help farmers' efficiency in water use, increase agricultural and food production, and make the population less vulnerable to climate change.